As you may already noticed Messer hasn't been developed since the end of 2000, so I decided to officially close this project. I recommend to upgrade, but If for any reasons this version does not work for you, you may still try previous one. Lame_enc.dll can be found here. Q1: Can you add feature X / fix problem Y / help me with Z? Q2: Is the source code of Messer available? Q3: I was recording something with Messer, but file contains silence (or just a little noise). Q4: Windows cannot shut down or reboot when Messer is running. 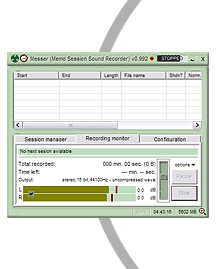 Q5: Can Messer record from tapes/lp/radio tuner/etc... ? Q6: Can Messer record streaming audio? Q7: Is on-the-fly mp3 compression possible with scheduler? Q8: Lame Enc has lots of parameters, tweaked high quality modes ("alt-presets") etc. Why can't I use it with Messer? Q9: What compressor was used to pack Messer's executable? Q10: Does Messer work with Windows 2000/XP? Q11: The mp3 compression options are grayed out. Why can't I choose it? Q12: Can Messer be used under MacOS, Linux, (insert you system here)? Q13: How can I record "by hand"? Can't find "record" button. Q14: How can I turn on the level meters? Q15: Does Messer allow a user to record for an unlimited amount of time, up to the hard drive's capacity? Q16: What are the minimum CPU requirements for on-the-fly mp3 recording? Q17: How can I cut/trim MP3 files without reencoding? Q18: Messer asks me for output file location each time I start recording. How can I avoid it? Q19: I'm getting "MP3: cannot load library!" error. A: Well for first two question answer is: no. Development IS stopped/suspended for now and I don't really know if and when I'll continue. A: No, and it won't be. Believe me - you wouldn't want to tweak this mess inside ;-) At first I wanted some simple wav recorder + scheduler, then mp3 recording was added as kind of "proof of concept" (that mp3-on-the-fly is possible, why shouldn't it be? ), then some more useful features came out... And adding them became a nightmare without some flexible architecture existing at first place. A: It's probably because you didn't choose recording source properly and/or didn't adjust its level. Choose "Run" command from system "Start" menu and enter: sndvol32 -R. It'll bring Volume Control application you probably already know, but with recording controls instead of default playback ones, so now you can choose source and recording volume. Adjust volume so it is high but never reaches full level (look at Messer's level meter - it should never reach 0dB). Too low volume will give you noisy recording - too high will lead to unpleasant distortions ("clipping"). A: That depends on what you really mean by that. On most soundcards (virtually all modern ones) it can sample anything that your computer is playing including the sound coming from streaming audio players. Simply choose special "loopback" recording source in system sound mixer (it's usually labeled "WAV", "stereo mix", "direct sound", "what you hear", etc). But this way you'll loose some quality because the sound is converted from digital to analog and then back to digital and you'll change the file format (to WAV or MP3). While the first has usually small impact on sound quality, transcoding to MP3 can be more harmful. Q12: Can Messer be used under MacOS, Linux, (insert you system here).